Now, because she will not abandon a boy who is both trouble and troubled, she’s tied to this intense, stubborn man who arouses her in ways she’s never known … and who could break her completely. 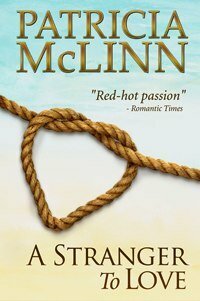 Can she take the risk that in this man she might find a stranger to love? Sheriff Tom Milano glared at the computer. He was too old for newfangled machines. He oughta be fishing or two-stepping with Rita. He stabbed one of three keys with an arrow aimed up. Words on the screen jumped and disappeared. “Gol’durn it!” Rita didn’t like him talking rough, but the following torrent constituted an avalanche of backsliding. Guilt jumped on him faster than a fly on road apples. Tom Milano settled the well-worn hat into the groove in his gray hair and set out to restore the peace of Bardville, Wyoming. Jessa Tarrant nodded. What did this matter? Who was where had nothing to do with what had happened or what would happen. The sheriff’s vague question and the silence that followed were an implicit request for more information. For a long moment, Jessa thought the other man wasn’t going to comply. Sheriff Milano waited with no sign of impatience or irritation. The tight line of Cully’s lips eased and one side lifted in the smallest, most reluctant of grins. As the sheriff damned well knew, Jessa thought. She shifted to her other foot and recrossed her arms at her waist. Tom Milano had been at the wedding of Boone Dorsey Smith and Cambria Weston ten months ago and at their combination belated reception and going-away party last October before they spent the winter in North Carolina. Even if Cully Grainger hadn’t been Boone’s best man and among only a handful of guests from beyond Bardville, he wasn’t someone you forgot. He was nearly six foot four and rangy, with thick hair the color of walnuts. He moved slow, talked slower, and the sun could rise in the time it took his grin to take full effect. He presented an aura of supreme, imperturbable calm. Except for his intense blue-green eyes. And those he generally kept hidden behind mirrored sunglasses. He hadn’t kept them hidden the night of the going-away party. The night he’d insisted on driving her home. The night he’d invited himself in for coffee, and she’d said okay. The night she’d made one mistake, then almost made a much worse one. Jessa followed the direction of the sheriff’s gaze to the bottom shelf, which held containers of cleansing powder. The once-neat row looked like a line of soldiers about to allow the enemy to break through–or like a line of containers jostled by a shoe pushed among them so someone could stand on the shelf to reach higher. On the second-to-the-top shelf, kitchen gloves, each pair enclosed in plastic, had tumbled from their usual neat stack. Cully opened his hand to reveal a four-inch-long red-cased pocketknife, with enough gadgets and tools to replace a drawerful, and a price proportionately high. Because tourists liked the knives, they were among the few luxury items Jessa stocked. She automatically took the end of the pocketknife he held out. He didn’t immediately release the other end. She glanced up. He seemed to be staring at the knife. His face was unreadable. The sheriff cleared his throat, and Cully dropped his hand. “That doesn’t mean this knife came from here,” she said. Something in her kept pushing to prove the boy’s innocence. She didn’t bother to wonder what it was. “The price sticker is from your store,” Cully said. She gazed at the knife in her hand and the sticker that carried the name “Nearly Everything” along with the price. She wished she could make it disappear, along with the boy who tugged at her sympathies and –especially — the man who tugged at something else. The sheriff looked from the pocketknife to the shelves to the boy and back to the man. Beneath Cully’s even confirmation, Jessa caught an undercurrent. Boone and Cambria hadn’t said much, but she’d gathered Cully might be leaving public police work. Though it hardly mattered. No matter how far from a uniform he got, anybody could see this man would forever be a cop inside. Look at how he reacted to his own nephew. The question surprised Jessa, but Cully showed no reaction. That figured. He wouldn’t care for the muddle of emotions, especially not emotions like surprise or confusion. The sheriff breathed out through his nose. Rocking back on the heels of his worn boots, he turned slightly to face the boy. It could be, Jessa thought, that Tom Milano had encountered this adolescent reaction a time or two before in his career. She allowed herself the first sliver of amusement she’d felt since she’d spotted Cully Grainger’s long strides bringing him toward her store and had developed an urgent need to do work in back. “It’s your duty,” Cully said flatly. The calm, cool words felt like slaps against her face. Long remembered, and hated. You’re old enough to know right from wrong. “It’s not,” Cully interrupted without emotion. Jessa thought she caught a flicker of movement behind Cully’s sunglasses, as if he’d closed his eyes. “Travis.” Cully’s single word sounded a warning. Cully’s hand shot out and grasped the boy’s shoulder, not hard, but enough to turn them face-to-face. Jessa didn’t breathe as man and boy stared at each other, the man’s eyes hidden, the boy’s brimful of fury. The muscle at the side of Cully’s jaw flexed, then his hold eased. Travis jerked his shoulder free. He leaned against the shelving, a posture of complete indifference, except for his hands clenched into fists. She sensed curiosity behind the sheriff’s professional calm. Most shop owners wanted shoplifting punished. But she had no obligation to explain. Her reasons were personal, and she didn’t owe anyone an explanation. Including Cully Grainger, whose mouth and forehead were drawn tight in a frown. Tom Milano scratched his jaw. “True enough, but Harry’s been the board’s squeakiest wheel a good, long time, so I suspect he’s first on their list for oil–or elbow grease in this case. So that’s the official way,” the sheriff went on, “if a shop owner or a concerned citizen pressed charges and we did this official like. Another possibility is to let the whole thing drop.” He questioned Cully with a look. It was as final as a word could be. The look of bright expectancy he focused on Cully, then Travis, then her, didn’t fool Jessa. Tom Milano was as crafty as they came. Jessa eyed Travis. He wore a faded T-shirt several sizes too large over baggy jeans. Beneath a turned-backward baseball cap his hair had been shorn short in the front, with a straggle of longer hair at the back. The little she could see of his thin face as he stared at the floor revealed a turned-down mouth and a pugnacious chin. He’d be more hindrance than help, since she’d have to explain and supervise everything. That happened with any new employee. With this boy resenting every second he spent here, it only promised to be worse. Having him around would be like having a black cloud in the store. Or like gazing into a twenty-year-old mirror. If only Cully would change his mind . . .
She turned to him, and knew there was no chance. His jaw was as pugnacious as his nephew’s and his mouth, while neutrally straight, was as firm as an unshakable resolve. For all his slow talk and outwardly easygoing ways, this was a man who divided his world into right or wrong. Inside the law or outside. Saint or devil. Nothing in his world would dare to skip from one side to the other and back. Not even a twelve-year-old. She knew that kind of man. And she knew what it felt like to be a child ruled by that kind of man. Tom beamed at her, but the expressions of the other two males showed no sign of lightening. “Why on earth not?” she demanded. “Will you do this?” The impatient words contradicted a slight easing around his mouth. They stared at each other across Jessa’s sun-drenched living room. At least she stared at him, and she presumed he stared back. She considered demanding he take off the sunglasses, except she knew from experience that his eyes could be more unsettling than the mirrored lenses. She couldn’t reconstruct all the conversation that had sent her and Cully here. Tom had been suggesting places that would have made the thing seem like a date; she’d countered by proposing they talk in the shop’s back office. There had been comments about it being small and not very private, and all of a sudden she’d been backed into a verbal corner of either saying outright she didn’t want Cully Grainger in her house, or giving in as graciously as she could. She gave in. Jessa looked at Cully, sitting there so at ease on her couch, and desperately wanted to think him smug and rigid. He’d walked into her living room and gone unhesitatingly to the couch, where he’d sat only once before, one night last fall. This time he’d dropped his jeans-covered fanny in the very middle of the three navy-and-yellow floral cushions. If she’d sat on the couch they would have been nearly hip to hip, like two lovers side by side. She not only hadn’t sat on the couch, she’d bypassed the upholstered chair at right angles to it and taken the straight-backed chair by the door. That didn’t seem to bother Cully any. He spread his long arms along the couch’s back in a posture of relaxed possession. His body language screamed a man settling in and not about to be easily ousted. The disquiet she’d felt since that first glimpse of him deepened. “Why’d you bring Travis here?” she demanded. She didn’t answer. Because he clearly wasn’t going to tell her what she wanted to know. Why hadn’t he gone home when he’d faced trouble with his young nephew? It hinted at a vulnerability in him she didn’t want to see. Vulnerability could be contagious. Oh, yes, she wanted to think him smug and rigid. Except Cambria and the Westons would not have taken to anyone–best friend of Boone’s or not–if he were smug and rigid. Besides, she kept hearing something in his words that prevented her from dismissing him so easily. Almost as if he were afraid. For Travis? Of what? There might not be time to wait for him to learn . . ..
“More iced tea?” she asked abruptly. Before he could answer, she’d started for the kitchen. At the narrow doorway, she turned and blocked his way. “I’ll be right back.” She didn’t bother to sound cordial. “You forgot the glasses.” He held up the two he’d collected. “No, thanks. I don’t want any more tea.” He stepped forward, and she could either back up or be a heck of a lot closer to him than Mrs. Palmer had allowed in eighth-grade dance class. She backed up. He went on in, with her trailing behind. The narrow opening in the U-shaped kitchen seemed even narrower than usual with Cully in it. He looked around the small area, his gaze seeming to rest on the green glass bottle on the sill with the impatiens cuttings she hoped would root, on the glass apothecary jars she used as canisters, on the vibrant geranium print of the hand towel looped over the oven door handle, on the white-painted metal cabinets and worn countertops. His circuit brought him face-to-face with her. She’d forgotten he hadn’t seen this part of the house last fall. Only the living room. And the threshold of her bedroom. She didn’t want him in her kitchen. She didn’t want him in her house. She didn’t want him reminding her. Not of that night last fall, not of a more distant past, not of impossibilities. Nerves kept the spigot on her mouth open full throttle. If she talked fast enough and long enough she’d forget how Cully had held her, kissed her. Forget how she’d felt when she’d told him to leave, and he’d turned away and left her at her bedroom door. Forget how many times she’d wondered what would have happened if she hadn’t told him to leave. He didn’t answer immediately. She grimaced. Perhaps he was making sure he wouldn’t be run over by another freight train of words. There it was in his voice again, the note she couldn’t pin down. The one that made him too human for comfort. Then, before she could try to isolate that note and define it once and for all, he was speaking again. This time with no hidden notes. He turned his back to her and with a quick motion upended the glasses. The only sound was liquid and ice cubes hitting the sink. Jessa stared at his broad shoulders, taut under the plain white fabric of his shirt. She closed her eyes and drew in a deep breath, trying to erase the picture of an emotionally deserted boy his words had called up all too quickly. She knew the kind of pain Travis must be feeling. She understood it. Hers was an older pain and not as deep, perhaps, but still sharp, and very personal. Face it, there’s no way you can walk away from Travis Grainger. She flopped back so her shoulders pressed against the refrigerator. Okay, she’d do what she could to help Travis. And she’d do her best to get along with Cully in order to accomplish that. She would also be careful. Very, very careful. “What for?” He seemed to stare out the window over the sink. His deep voice speaking her name seemed to reverberate on her nerve endings, especially the ones up the back of her neck and into her scalp. Careful. Very, very careful. “The hell you don’t.” The words had no heat, yet plenty of underlying steel. She’d known it was a mistake to have this talk at her house. It was sure to bring up memories of the only other time he had been here. Memories like the ones filtering heat through her blood and urgency through her breathing. She could ignore his reference to that night, or she could face it head-on. He wanted honesty? Fine. His low voice sliced at her with a harsh edge.